There are many Christian churches like this one in Nepal. Residents of Nepal will participate in a historic democratic election Thursday, April 10. Voters will choose a Constituent Assembly, which will be charged with writing a new constitution and reintroducing democracy to this tiny Himalayan nation. This week’s elections promise to be tumultuous. The past few months have been marked by violence between the various political parties and bomb blasts by rebel groups. Gospel for Asia leaders in Nepal are asking for prayer, saying that the situation in the country is tense and that there seems to be little hope for a peaceful election. Getting around in Nepal can be difficult. These missionaries walk on narrow mountain pathways to bring the Gospel to the villages. This week’s elections bring an official end to the monarchy, which has ruled the country since 1959. Politicians promise the new constitution will guarantee religious freedom. They also promise that Nepal’s new government will be secular. The country has officially been a constitutional monarchy with Hinduism as the official religion. This week’s events are in sharp contrast to the events of the last two decades. Nepal’s beloved King Birendra, Queen Aishwarya and several members of their household were murdered in 2001. On the heels of this tragedy, King Birendra’s brother, Gyanendra Bir Bikram Shah Dev, ascended to the throne. Shortly after Gyanendra’s reign began, the Maoist party—heavily influenced by nearby China—waged a civil war against the constitutional monarchy. The United Nations estimates more than 12,000 people died and another 10,000 were displaced by the war. It came to a tentative end in 2006 with a peace agreement that allowed the Maoists to join a government created when the king relinquished his power. In late 2007, the Maoists walked out, demanding that the monarchy be abolished. Legislators agreed to the demands—the monarchy is scheduled to end this year—and the Maoists returned to their legislative posts. GFA leaders ask for prayer for peaceful elections. They also ask for continued prayer for Nepal as these new legislators create a new constitution and government system for the country. Pray also that GFA missionaries will be free to continue working in Nepal and that the churches will continue to shine the light of God’s love. The life of a Dalit in Asia can be very difficult, but many of these precious "Untouchables," like the woman pictured here, are hearing of their worth in the eyes of Jesus. 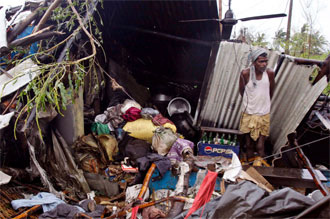 The name of Christ is forever changing the lives of the Dalits (“Untouchables”) who live in a Karnataka, India, slum. Gospel for Asia missionary Sampath, a Dalit himself, is committed to serving his fellow Dalits by bringing them the Good News. Sampath recently met Dilip and Anita, a couple whose three-year-old son, Sunil, was suffering from an unusual illness. The boy had small tumors throughout his body—and bumps on his waist, hands and legs. Dilip and Anita took Sunil to a medical facility for treatment, but it did not help. They also took him to several temples, pleading for a cure. But Sunil’s condition stayed the same, leaving Dilip and Anita very discouraged. It was around this time that the Lord led Sampath to cross paths with them. As he shared the message of Christ’s love with this couple, they told him of the sickness that had befallen their small son. Assuring them of Jesus’ power to heal, Sampath prayed for Sunil right then. He also encouraged the family to come to church. Dilip and Anita began attending the services and listened to Sampath teach from the Scriptures. Meanwhile, Sunil’s health gradually began to improve. Within three months, the Lord had completely healed him. Witnessing this miracle, Dilip and Anita put their trust in Christ. Growing up as a Dalit, Sampath has a place in his heart for those who, like him, have suffered much more than the rest of society. He knows their lives can have value in the love and salvation of Jesus Christ—because He has personally experienced this hope. As a child, Sampath lived with his parents, two sisters and two brothers in a very poor household. Life was often a battle to survive, and there were times when they did not have much to eat. But the greatest difficulty for Sampath was the hopelessness he and his family felt every day in spite of their devotion to their deities. As Sampath grew up, he sought fulfillment through various means. He became addicted to drugs and alcohol. He was also mingling with friends who had a negative influence on him. They were known for being bullies who physically and mentally tormented people. During this time, Sampath’s heart became so hard that he had no compassion toward people. But he also had no peace. Then Sampath met a Christian pastor who gave him a Gospel tract and urged him to read it. Out of curiosity, Sampath asked questions about the tract and its message. The pastor shared the Gospel with him, and Sampath received Christ. This young man’s life drastically changed. Within a few years’ time, he enrolled in a Gospel for Asia Bible college to study God’s Word. Devoting himself to full-time ministry after he graduated, he saw 15 people receive Christ through his witness in one area. It was then that he visited Dilip and Anita’s slum village, prayed earnestly for Sunil, and told them about Jesus. And today, by God’s grace, their lives will never be the same. Sampath requests prayer that Sunil’s parents will grow in their walk with the Lord. He also asks for prayer that there will soon be a full-fledged church in this slum where Dalits can come and hear about their worth in the sight of Jesus. Fearlessly, Santosh shared the message that the Lord showed him. Santosh’s village in Manipur, India, was dominated by 30local priests from a traditional religion. The priests often boldly condemned Christianity. Afraid of the priests, the villagers followed them because it appeared that the priests could hurt them through magic. One of these priests, Nadish Rahul, had his own radio show to propagate his beliefs. He vehemently proclaimed that the deity he worshipped was the true living god, and he regularly blasted Christianity on the show. During one of his broadcasts, Nadish fearlessly challenged the local Christians to debate the two religions. The Christian leaders in the area chose Santosh to represent them in the debate. Santosh feared that he would be too nervous to present a strong message, especially in a debate with someone like Nadish, who was an experienced public speaker. Poring over the Scriptures and fervently seeking the Lord’s direction, Santosh began preparing for the big day. But he was still unsure of the best way to share about his faith with this hard audience, even the night before. Tossing and turning, unable to sleep, Santosh continued to pray. Then at 2 a.m., the Lord placed on his heart exactly what to say. Praising God for providing the answers just in time, Santosh knew he was ready. The next day, everyone gathered to watch the deliberation, including the 30 experienced priests from Nadish’s religion. The group chose Santosh to present his arguments first. Standing before the glaring audience, Santosh shared the Gospel message exactly the way the Lord had showed him. Suddenly, all of the priests began arguing among themselves, and they came to the conclusion that Jesus was a real God. They told Nadish he was wrong and the god that he shared about on the radio was false. Then to everyone’s surprise, Nadish admitted that after hearing Santosh’s presentation, he believed Jesus was a “True God” as well. Now the priests, including Nadish, do not oppose the local Christians. Although they have not accepted Jesus as the one true God, they are more open to the Gospel message. Because of the debate, Santosh has had many opportunities to share his faith, and several people in the area chose to receive Christ into their lives. Santosh asks for prayer that Nadish and the other priests will put their complete faith in Christ alone. He also asks for prayer that the new believers will continue to grow in their walk with the Lord. Posted on October 17, 2013 by Mark G.
To find out more information, go to Gospel For Asia’s website. Prem Billa is one of the missionaries arrested this weekend in India. Four men who are part of a Gospel for Asia film team arrested Friday night in Madhya Pradesh, India, are still in jail today. The team was screening a movie about the life of Christ when they were arrested. They are scheduled to appear before a judge on Tuesday, April 1. The team, comprised of GFA-supported missionaries Nima Venkatesh and Prem Billa and two volunteers, had secured all the necessary permissions from the police and village authorities to show the film. But a radical, anti-Christian organization in the area alerted some higher government officials that the Christians were showing the film and accused them of forcibly converting people to Christianity, which is illegal. The police then arrested the missionaries and seized their equipment. Because the men were arrested on Friday night, they had to wait until Monday for the court to open. When they attempted to appear before the court on Monday, there was no judge to hear their case, so it was pushed back until Tuesday. GFA President K.P. Yohannan says the film team is living out one of the lesser quoted promise of Jesus from Matthew 10:18. Christian leaders in Madhya Pradesh are also trying to set up meetings with district authorities to have the men released and their equipment returned to them. “We are also praying that God would speak through these leaders when they meet with the local authorities,” Yohannan said. Yohannan asks for prayer for the film team and for the leaders speaking on their behalf. He asks for specific prayer that they would not be disheartened at this point of difficulty and that the Lord’s presence and comfort would be real to them at this crucial time. Many people only know to turn to traditional gods for help. Suren was only 25, but his wife and two children were about to lose him. As he lay in his hospital bed, the news of all the medical treatment he needed—and could not afford—overwhelmed him. In this time of need, Suren and his family needed to receive hope from their gods. But instead, the silence that followed their prayers filled their hearts with empty despair. Then Gospel for Asia missionary Badil met Suren’s family. Badil listened to Suren’s wife pour out the stories of hepatitis, appendicitis, and lack of money for vital operations. Native missionaries often see God answering prayer in miraculous ways. By the time Badil left the home, he had shared hope from God’s Word and prayed with Suren’s family. He also invited them to a prayer meeting he was having later that night in a local believer’s home. To Badil’s surprise, the family came to the prayer meeting—with Suren! The dying man listened to the words of life, and he believed with the Christians that God could save his soul and restore his health. The next day, doctors told Suren he no longer needed any operations. Awed by the power of this miracle, Suren and his whole family received salvation. Suren’s testimony also helped lead five families in their village to the Lord! These families formed a new fellowship, which Badil is faithfully caring for. Badil asks for prayer for Suren and his family to grow in the Lord and continue boldly witnessing about God’s miracle. Posted on September 9, 2013 by Mark G.
The number of illiterate men and women in South Asia is well into the hundreds of millions, with women being the majority of those who have never learned to read or write. Gospel for Asia pastors and Women’s Fellowship team members look forward to International Literacy Day, on September 8, as a special opportunity to reach out to their communities with programs that explain their literacy classes as well as share the Good News of Jesus. Last year during the church’s International Literacy Day program, Pastor Radhesh encouraged the women to learn to read, so they will be able to study their Bibles and teach their children to do the same. In another area, women missionaries shared the same message as Pastor Radhesh, encouraging local women to participate in literacy classes as well. Around 50 women gathered to hear what the ladies shared. Narayana, a local elderly man, sat away from the crowd and paid close attention to what the missionaries said. The women missionaries noticed he didn’t move from his spot after the program and quickly approached him. He told them what a good thing they were doing for the community and that their parents should be very proud. The women gave him a piece of Gospel literature, and his response echoed the struggle that countless people in South Asia face when they want to read something. As the women shared about Christ’s life, death and resurrection written in the piece of literature, Narayana listened carefully. By the time he heard the entire message, Narayana knew without a doubt Jesus is the only living God. He asked the women to go home with him to tell his wife about Jesus, too. When his wife heard about Christ, she decided to follow Him as well! International Literacy Day was a special day to Narayana and his wife, as well as to many others, because our missionaries shared the hope of a better future with them—both for this life and the next. Please pray for our workers, on September 8, as they reach out to men and women on International Literacy Day again this year. Posted on August 28, 2013 by Mark G.
The man stared at the boy he had just run over with his vehicle. The child looked helpless, lying on the street, a bloody mess—so he fled and left the boy to die. But the injured boy was not just a mangled body—he had a name, and there was more to his story. His name was Nandi, and he was 12 years old. He doesn’t remember how he ended up on the streets. He only remembers at a young age, he got on a train and ended up on the streets of a larger state in India. It’s suspected he was possibly sold, abandoned or abducted. Because he was on his own and handicapped due to polio, a man began using him to beg. He spent his days stretching out his hand at traffic lights, only to give most of the money he made to the man when the day was over. Nandi was left with very little money to survive on, so he kept working for this man who had many other abandoned children doing the same thing. It was after a day of begging that Nandi was struck by a car and left on the road, barely hanging onto his life. A woman saw his helpless condition and immediately took him to the hospital, where he received medical attention. He stayed in the hospital for several months while his body recovered. Once Nandi was well enough to leave the hospital, he was sent to a Gospel for Asia home for street children. “Seeing Nandi today, we would never imagine that once he lived in such a pitiful condition,” said a Gospel for Asia correspondent. Nandi is now eager to go to school each day and happily participates with the other children in their activities, like dancing and performing skits. The staff members at the children’s home are currently working to enroll Nandi in a school specialized to help him learn and grow most effectively. The boy who was once so close to death has now been given a radically different life—and the opportunity to learn about the amazing love of Christ. ■Nandi’s continued healing and growth at the children’s home. ■Protection for children like Nandi who are being used by adults for profit.